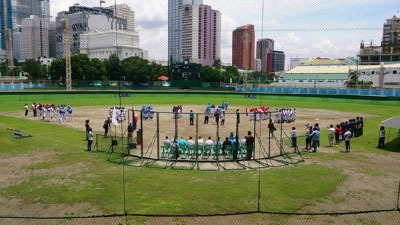 The 8th Asian 12-Under Baseball Championship started on August 27, 2014 at the Rizal Memorial Baseball Stadium in Malate, Manila. Philippine Amataur Baseball Association (PABA) hosts the tournament sanctioned by Baseball Federation of Asia and the opening ceremony (see photo) was a great success, attended by a number of VIP’s including the Chairman of the committee on games and amusement & sports, Honorable Senator Mr.Sonny Angara, President of Philippine Olympic Committee, Mr. Jose Cojuangco JR., Chairman of Philippine Sports Commission, Mr. Ricardo Garcia, PSC Commissioner in charge of baseball, Mr. Jose Luis Gomez, PABA President, Mr. Marty Eizmemdi and also the Secretary General of BFA, Mr. Lin Hua Wei. For the first two days of the event, Chinese Taipei and Japan are sharing the top spot with 2-0 followed by South Korea (1-1), Singapore (0-1), Indonesia (0-1) and the Philippines (0-2).